Motorola today announced a new keyboard accessory for Motorola phones with serial and DUN Bluetooth profiles. The TXTR D7 is a QWERTY keyboard with a four line monochrome display. 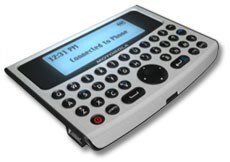 The TXTR connects to a compatible phone via Bluetooth and can then be used to compose, send and read SMS text messages. It can also connect to other TXTRs for local chats without a phone and be used to enter contacts and other text into the phone. One charge of the TXTR should be good for 24 hours of messaging. It is due out in the first half of 2006. Does anyone have an informed idea of availability? I could definitely be interested in this based on price, it would probably lead me to more texting. Dead in the States, right? Does anyone seriously TXT in the US? I just use IM on my Sidekick. I have a group of friends and we seriously text but not all of them have bluetooth. Looks like a good device to me. Price with determine if I would but it though as the regular keyboard doesn't really bother me. The Sidekick is HUGE and lacks BT. I TXT alot and use IM on my A630. This would be great for all the phones without a QWERTY keypad. But I would still like to see more BT phones with the same format as the A630 and Sidekick. Texting is still pretty huge. I personally send between 600-900 text messages a month (depending on how busy I am that month). If it could do email, or be easily hacked to do email (pc bt trick? ), I may pay up to AU$150 (which is just under what I paid for my Vodafone labelled V360), but it also depends on the size too. this is going to be a bust, i honestly dont see too many people getting excited over this. I don't know.... seems like not a bad idea.... the real bust might be the price... can't imagine anyone paying a lot for it though. Personally, if I'm going to carry around yet another accessory, and a keyboard at that, I want to be one with 3/4 size or better keys so that I might be able to type with it.